The N.C. Chronicles. : Exposed once and for all, the misconception and feminist lies about the male gender. By a woman. Exposed once and for all, the misconception and feminist lies about the male gender. By a woman. 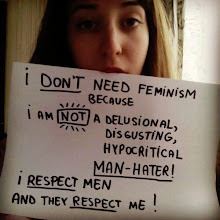 I think this is the best report I have seen so far, exposing the lies feminists spew out about men, it exposes the truth about them...Hatred of men, demonize at all cost, even at the expense of the truth. And this from a woman....who is also gay. You can't have it better than this. A self made man---female reporter goes undercover as a man. "This wasn't just a stunt. This was about learning. This is a human project. It was about finding something out about the human creature. ... And I learned it the best possible way because I went through it," Vincent told "ABC's 20/20's" JuJu Chang. At 5 feet, 10 inches and 155 pounds, Vincent passed as a medium-build man she called Ned. Her transformation began with a buzz cut, baggy men's clothes, and a too-small sports bra to flatten her breasts. She even wore a little padding in a jock strap. For the rest, she enlisted the help of makeup artist Ryan McWilliams, who created Ned's five-o'clock shadow. When you mess around with that, you really mess around with something that you need that helps you to function. And I found out that gender lives in your brain and is something much more than costume. And I really learned that the hard way," she said. Vincent says her views about men have changed forever. Ironically, Vincent said, it took experiencing life as a man for her to appreciate being a woman. I like it more now because I think it's more of a privilege."